What a fantastic way to spend a weekend, throwing disc hanging out with old friends and making new ones. Thanks to Siep with the preparations. We didn’t have to do much as the council who are more than fully behind us regularly cut and keep the grass short. How lucky we are! Thanks also to Brett Hailstone and Nigel Barnwell who designed the original shorter, hilly, incredibly open 18 hole course back in the late 90’s. We’ve now got two additional long more challenging course with a combined total of 24 baskets. And challenging it was! 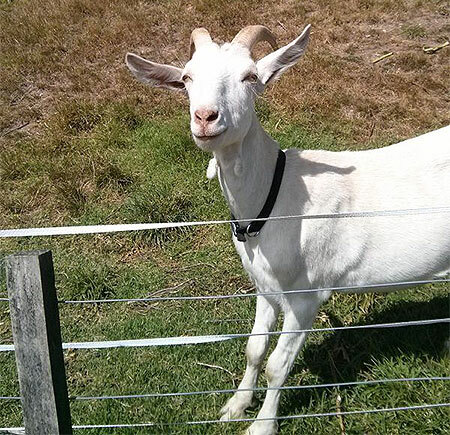 It must have been disconcerting for visiting players to Waiheke seeing the locals coming up to the tee’s not being sure what to do with the unpredictable winds. One of the testing aspects of having such an open course is the “wind factor”, which decided to increase it’s strength and blow from the north-west, as opposed to our standard south-westerly’s (we were feeling the force of a distant cyclone that was hovering around us). We also had to contend with the small turbulent eddies of wind that seemed to appear from nowhere. It often felt like no matter which direction you were driving the wind was in our faces. 22 of us turned up on the windy cloudless day, ah yes full sun, little shade, yet another one of the taxing experiences of playing 3 rounds on Waiheke. 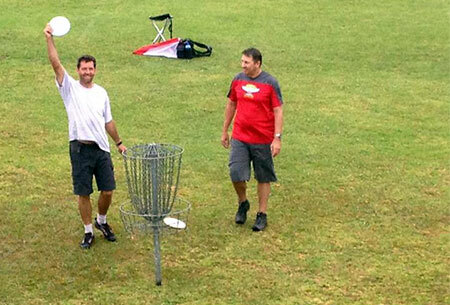 It was great to see such a strong group of disc golfers. 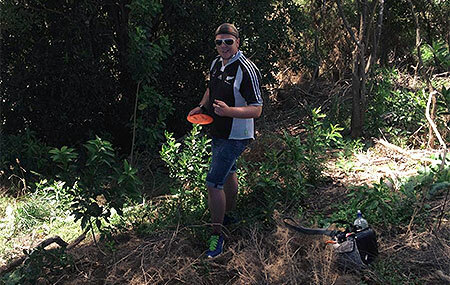 Simon Feasey, our current NZ Disc Golf champ, having just won Rotorua played some outstanding golf - he had a first round of 55, 1 over par. He took on board that when the conditions are so windy, placement is key if you want any chance of getting under par. And no surprise he turned it on for us and had a blistering second round of 48, which in these conditions was almost the perfect round, with 7 birdies and one slight blemish to his card, a 4 on hole 8. Brad Muir from Auckland also started strong with a blistering first round of 53, taking the lead, with David Keene, Siep Van Vliet and the Hailstone brothers all shooting sub 60’s. Martin “Moe” Doerken, our “local” from Germany, Chris Dixon from Christchurch and myself found the going a bit tough, with first rounds of 61. There was an array of constant sounds of disappointed expletives as we watched our drives fly miles away from our intended target, and mouth dropping moments of, “I can’t believe what I’m seeing”, as our gentle delicate approach shots were taken on unpredicted journeys. (comforting though to know that the TD was probably the noisiest). It was so important for us all to read the wind well, which included the strength of our throw, the shape and angle of the disc as well as good pin placement. 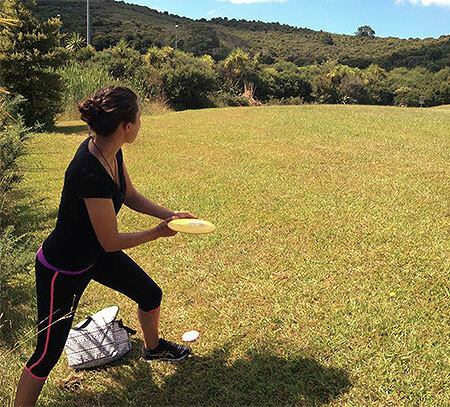 There’s nothing more challenging than being only a few meters from the basket, putting into the wind and not knowing if the disc would stay in the basket, coupled with fear factor of not knowing what would happen to your disc if you missed. Most of the strong field behind the top 6 were finding the combination of elevation, wind and tricky basket placements hard to read. Logan Papuni confidently held his own in the top 6 at Rotorua struggled in the first two rounds, however finished on a high with a last round of 58. Better watch out, Logan’s now throwing an ExCal! Ken Little from Canada showed us some classy drives and Haydn Shore from Auckland's Woodhill Forest treated us to some superb accurate approach shots. Chris Kingsnorth threw well in round 1 and 3. Enthusiastic Brady Kuech helped out again and loved the challenge along with everyone else who come away with more disc knowledge and skill. Our other local Malcolm McMartin found the unusual winds tough going. Late arrival Holly DeCoste from Canada displayed some lovely technical throwing. She improved from her first round and took the Womens Open from Coby Woller, who’s ever improving golf has impressed many on the Tour. It’s great to see another committed women on the tour. It was also great to see Aaron Miers make the trip all the way from Queenstown, and another Rotorua regular on Tour, Andy George who both found the windy course on Waiheke unforgiving. Come Sunday we were blessed to have some cloud cover for round 3. And thanks to that cyclone, we even had some refreshing rain to cool our worn, tired and hot bodies. Simon had blistering third round of 49, again with 7 birdies, and a slight blemish of 2 bogies - wow. This was enough to put him in the lead by a massive 14 strokes. Sitting in third place after the first two rounds and only one shot behind Brad was David Keene, we would have loved to have known what he had to offer for us in the 3rd round, however unfortunately he had to pull out with a thigh injury as a result of one of the best diving catches we have seen in the now famous Onetangi Beach Frisbee Chuck. This all meant that if the field stayed the same that I would be in the top 6. Surely my 3 stroke lead over my fellow Grand Masters Brett would be enough...? Brett had a really tight and steady third round of 53, (only bettered by Simon’s 49) and deservedly took the title of GM. After the top 6 there was no change in the leaders board apart from “Moe” pulling one shot back on Brett to equal fifth. Congratulations to Nigel Hailstone who despite getting in a lot of trouble in the last round, recovered like a true champ to take the Masters. Well done to Siep who’s not been playing that much recently for placing 3rd in the Open. To Simon, showing his brilliance to take the Open. A real big hats off to Kip Hailstone, Brett’s 8 year old son, who won the Juniors. It’s lovely to watch him throw a disc, (which at times looks like it’s bigger than him) with such fearless ease. Brother Jacob Hailstone similarly showed us some really stunning golf, with his amazing sublime forearm. 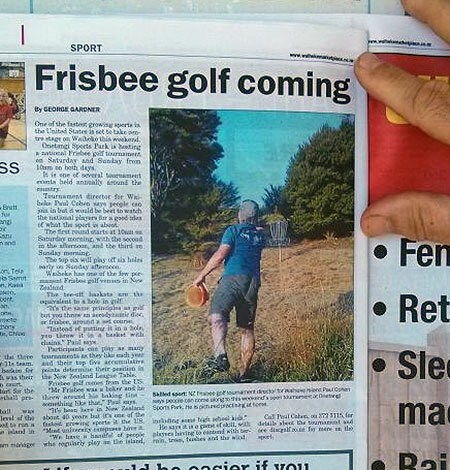 I so hope they carry on playing disc golf, they could both be players to reckon with - world wide. It was also great to see Simon’s girls turn up for the last day, they both have amazingly good driving techniques. A final thanks to Brett for his time and generosity in putting on the beach BBQ, with fresh mussels and snapper. It’s got to be one of the best Saturday evening get togethers on the tour. Motionless Lefties - Still happy after a Super Six round in the rain are - from left - Nigel Hailstone, Brett Hailstone, Simon Feasey, Siep van Vliet, Leftie Muir and Moe Dorken. Fairways - Competing in the womens division were Holly De Coste (Canada) and Coby Woller (Rotorua), enjoying the sun a little bit more than the wind. Room with a view - we just had to share with you the scene for the evening disc golfing attractions. 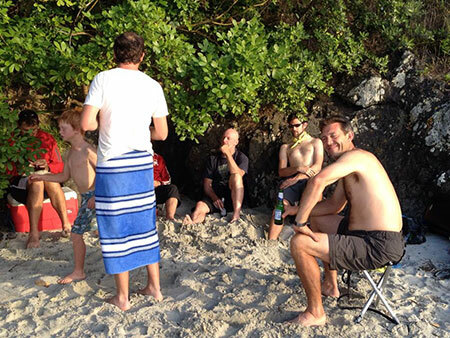 Ladies and gentlemen, presenting Onetangi Beach, Waiheke Island. 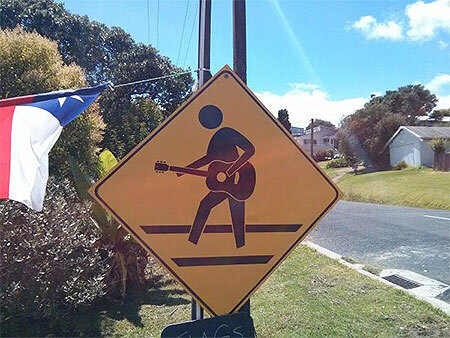 Caution, Falling Rock - only in Waiheke Island. 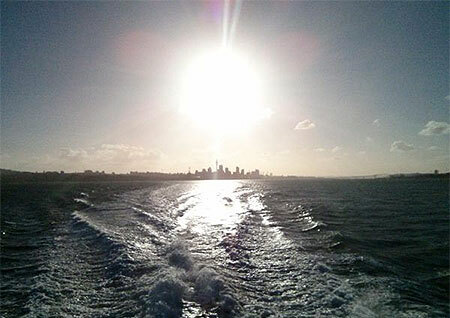 Goodbye Metropolis - one cannot but feel a ripple of anticipation when traveling from Auckland to Waiheke Island for a few rounds of disc golf. 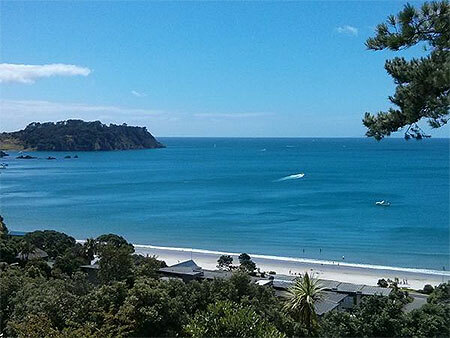 Whilst this isle of paradise is officially part of Auckland City, it's almost tropical climate (always a few degrees Celsius hotter than the mainland) and relaxed locals give a sense of distance beyond reality. 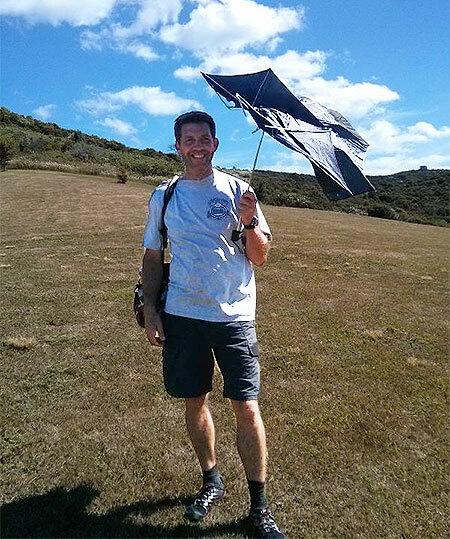 Protection Rejection - seeking respite from the fierce Island Rays, Simon Feasey's champion status meant nothing to the infamous Waiheke Whirl. But whilst the whirl was wicked, this athlete of air mastered the nuances of the climate to shoot yet more of the classy golf we have come to expect and admire. You Gotta Be Kidding - TD Paul Cohen was temporarily taken aback when he heard that local Ultimate player and gossip columnist Nanny McPhrizbee was thinking of entering. Paul was able to relax once he realised that Nanny was to nervous about her chances in the Caprine Division. Perfect Start - True to the bookies' picks, many times NZ Champ Simon Feasey (Oratia) ticks off his 2nd 50 point win in as many tournaments. Next challenge: the 2014 National Champion title. 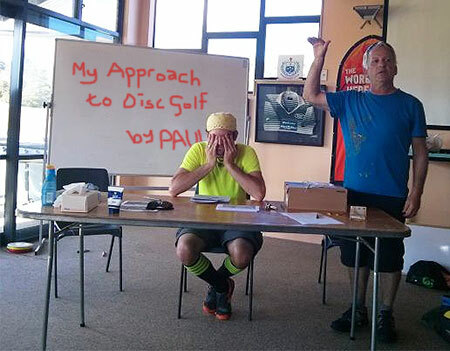 Oh no, not again - Registration assistant Brady looks forward to hearing again from Tournament Director Paul Cohen as he takes the opportunity to share with golfers his approach to the game including dietary strategies and how he has grown to the perfect disc golfer's profile through a strict regime of shouting. Media Frenzy - Paul managed to kick up a interest from the journalistic fringe with this article in the local rag. Gallery numbers swelled as a result (no, that was the rain did that - ed.). Lining It Up - A relative newcomer to the Tour, Coby Woller (Rotorua) is picking up the nuances of the game quickly. Watch out gals! "My disc is on the fairway, I'm looking for someone else's" - Part of the strong Rotorua contingent at this tournament was the radiant radio personality of Andy George who saved his best for the final round. 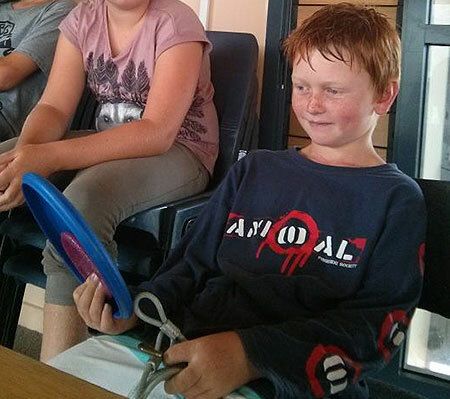 Red for Danger - Junior Champion Kip Hailstone (Surfers, Waiheke Island) reflects on the performance that earned him enough prizes and kudos to threaten professional status. Taking after his Dad, this freckled freak of fearlessness approached the game in a gun-ho manner that produced results in the windy conditions. 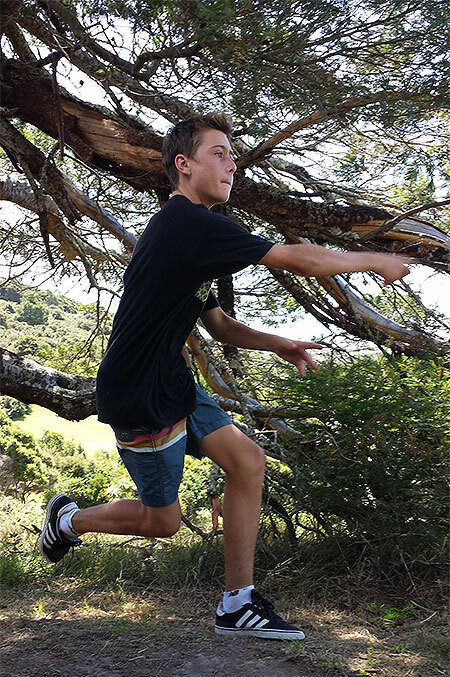 Inventor of the Onetangi Beach throwing move affectionately called the Kip Skip, this youngster has more potential than a wall socket in a shower. Bright Flight Delight - fluoro euro (well American actually - ed.) Brady Kuech analysed the shot needed for the killer 9th before launching milliseconds later - quicker than our camera could separate. Pictures cannot express the strength of the crosswind Kuech was up against here. Tasty Muscles - now famous, the post-Saturday golf BBQ at Onetangi Beach featuring fresh tasty mussels kicks into gear for another year. Oh yeah, another year. Yeah. 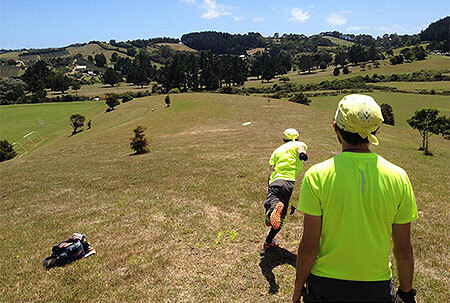 On His Way - Yet more of those famous Hailstone Disc Golf skills were on display courtesy of Brett's eldest son Jacob Hailstone who utilised some of his cricketing experience to calculate flight trajectories for some stunning throws. Or maybe he's just talented like Dad. 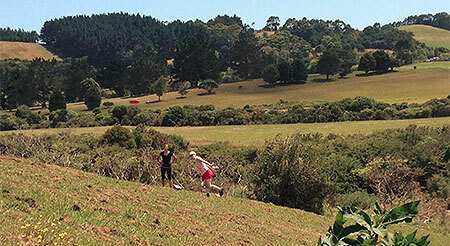 Four of the Best - Hole four warranted a spotter as we see Woodhull's Haydn Shore keeping an eye on local man Brett Hailstone's drive (the target basket is shown by the arrow, surrounded by dense native bush and nasty gorse. Sandy Playground - many versions of beach throw-catch were on display as the sun set on the Saturday. One especially entertaining moves was Tournament contender Speedo Keene's "Wallet Squash Dive" which, due to the large wads of cash in said wallet, resulted in a bruised thigh and a DNF!!. Winning Putt - At the end of regulation play, Simon Feasey displayed his class with this fine putt to compliment a fine drive resulting in a birdie 2 on the 18th. Ballsy Play - The picture once again cannot express the strong winds players had to contend with once the hot summer sun created the variable pressure zones. Speaking of pressure, here we see Jacob Hailstone making a ballsy shot at the basket on the 11th.